There are few, if any, subjects better suited to the noble art of bluffing than Brexit! This book gives the basics of Brexit: the history behind Britain's relationship with Europe, the referendum itself and the way it divided (and continues to divide) this country, the legalities of the split, and some of the areas which will be most affected. It drops in a few French, Latin and Greek terms, which the Bluffer should use to portray a certain je ne sais quoi. It's not a `How To' guide, but rather a `How To Pretend You Know How To' guide. (There is a subtle distinction.) So it will enable The Bluffer to drop in some esoteric facts, make a few opaque allusions, and convey the kind of inside knowledge usually confined to the most senior civil servants. 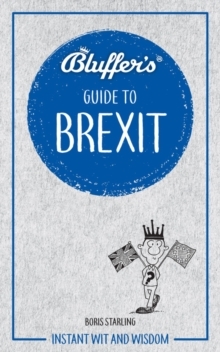 This book is a must for the current political climate!Written by experts and offering readers the opportunity to pass off appropriated knowledge as their own, the Bluffer's Guides provide hard fact masquerading as frivolous observation in one witty, easy read.